Greetings crafty friends. 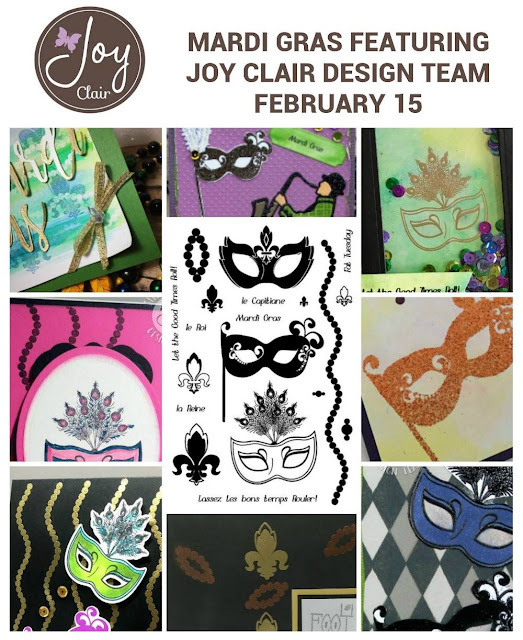 Today I am taking part in a fun inspiration time with Joy Clair featuring this fun Mardi Gras set. When this project was announced to the team, I was telling my husband about it and my first project came to mind. Due to the fact that I do enjoy watching Football (only because it is the only sport going on when NASCAR is in the off season) my two favorite teams which are actually rivals are the New Orleans Saints and the Atlanta Falcons. So this first project is in honor of the New Orleans Saints. All images were stamped with Versamark and then heat embossed using Recollections embossing powder in Gold and Copper. I thought the one bead necklace/bracelet ring looked a lot like the shape of a football, so I figured why not. The Football sentiment is from the Fall Planner set and heat embossed with silver glitter powder. After completing this project I thought about making another one since those masks just sat there not being used. So I went to work with it, stamped the masks three times on an angle and heat embossed with Ranger white embossing powder. I then used Distress ink daubers to color my page. 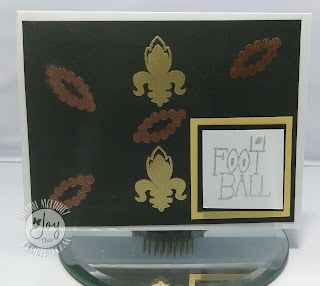 Using a Lawn Fawn die I cut the image and then adhered it to a black card base. I finished this off with 2 brads from my stash. I hope you have enjoyed my projects today. I know I had a lot of fun making them. Be sure to come back and visit again soon. Head over to the Joy Clair blog and see what the rest of the designers have created with this set. LeeAnn, great cards with this stamp set. LeeAnn, great colors and layout of your card. 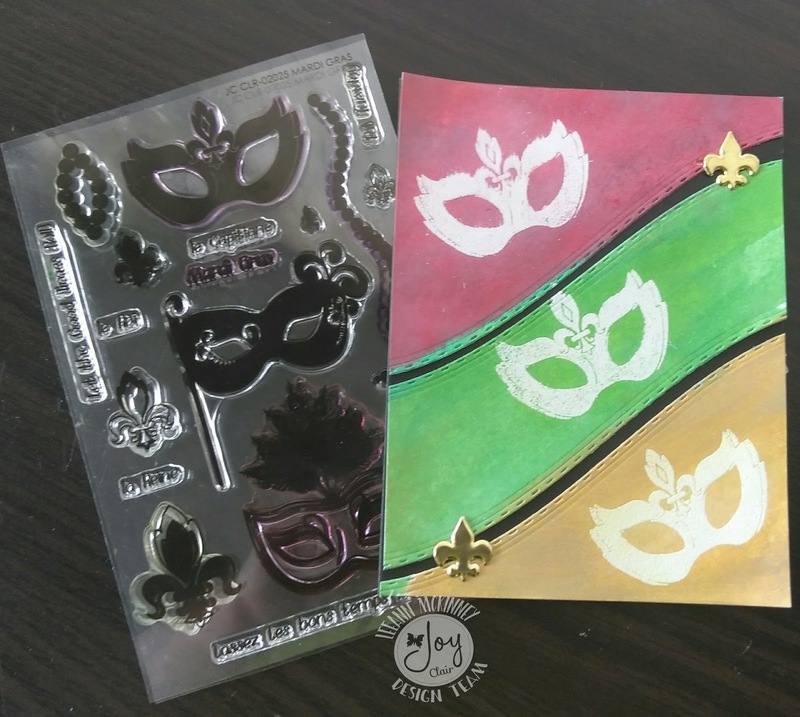 Wonderful colors for celebrating Mardi Gras. What a creative way to use this set!!! Pretty cards! !